I am so excited about this announcement! 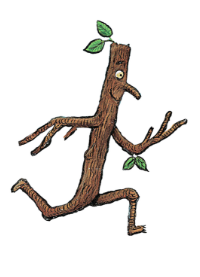 Stick Man is one of our favourite ever stories. In fact I will go as far as say it is possibly the book we have read more than any other. Our whole family can recite the whole book from start to finish now and despite my children probably being a little old for the story now, we still do secretly love it and it was Jack's book of choice to take into school for World Book Day this year. "Stick Man lives in his family tree. With his Stick Lady Love and their stick children three"
Stick Man Live is an award winning production featuring a trio of top actors and a show packed with puppetry, live music and funky moves and the production has received 5 star reviews from the likes of the Sunday Express and What's On Stage. The performance is aimed at ages 3+, but the whole family are welcome. I think it will make a wonderful treat for toddlers, pre-school children and those in early years and even Key Stage One. You can buy tickets from £12 online here or in person at the Tyne Theatre & Opera House Box Office during opening hours (10am - 3:30pm Monday - Friday and event days). I think tickets to the show have been released just at the right time and they'd make a fantastic Easter gift when teamed with a couple of the suggested ideas below. Let me know if you'll be buying tickets. This looks so canny! the girls loved the animation on a few weeks ago and we enjoyed the stick man trail up at hamsterley.